Experience absolute calm. Relax from work or effort, loosen up or become less rigid as tensions disappear. This program is a technique to relax the mind. Relaxing, breathing, letting go of tension, gentle thoughts, being content, are all part of this technique. Many people have reported that this program is very effective when used at bedtime with hyperactive children. It can be used at the end of the day or when time permits you to relax. Noticeable results tend to occur fairly rapidly. 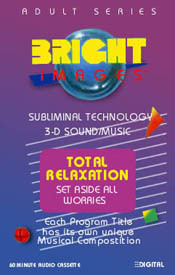 This program is popular with retailers when played in the background of their store sound system. Customers will normally have a reaction while they are in the store, commenting how much more relaxed they are. Commonly used by doctors in their waiting rooms, massage clinics, at home to relax at the end of the day and anywhere you want to become totally relaxed.